I am just returning from a trip to Montreal and Keystone, CO for the OOPSLA and Colorado Software Summit conferences. I spoke on SOA Patterns, workshopped my conversation pattern paper, and gave six talks on event-driven architectures and building mashups using Yahoo! Pipes and Google Mashup Editor. I only attended the workshop and the Mini-PLoP portion of OOPSLA. In some sense, these are often the most interesting portion of the conference. I once joked that if you want to guarantee something will fail, you have academics make a plan and have volunteers execute it. This is pretty similar to how OOPSLA is run. But strangely, it does work. Kagemusha is a beautiful movie by Akira Kurosawa. One of the most memorable scenes is at the end, when the petty thief, who served as doppelganger for an assassinated feudal lord, picks up a flag and runs into the battlefield to his certain demise. This is the image that came to my mind when Max started to argue with Erik Meijer about programming languages, trying to convince Erik that Ruby is just so much better than anything else. What a bloodshed. Too bad I missed Max's next suicide mission when he told Dave Thomas to his face that Erich Gamma conceived Eclipse. Ouch! I gave a talk on SOA Patterns at the Web services workshop, co-organized by Olaf Zimmermann. Olaf is doing his PhD on using patterns to describe architectural decisions and offer alternatives (he has a much fancier title, but that's how I understand it). I am usually a little skeptical when someone uses patterns in some tool or framework, but Olaf brings 10 years of IBM Web services consulting into the mix, so I am curious to see the results. In the ranking of technical conferences with dorky names, PLoP must rank right behind OOPSLA (if you speak German, by far the worst conference name must be WICSA!). PLoP is the Pattern Languages of Programming "conference". It's really a series of writer's workshops, which discuss pattern papers. A writer's workshop is a moderated session where one author shares a paper to be critiqued by other workshop members (typically also authors). The author is not allowed to speak or defend the paper, simulating the fact that the paper will have to stand on its own when someone reads it outside of the workshop. I workshopped my original Integration Patterns paper at PLoP 2002 and received a lot of great feedback from Martin Fowler, John Crupi, Brian Marick, and many others. Of course, a writer's workshop is only as good as the people attending. This time I was able to recruit Ralph Johnson and Olaf Zimmermann into my session. I workshopped my paper on conversation patterns. It's a little long (45 pages), but I got a lot of great feedback, which I will start to incorporate. Hopefully I will have enough substance to post the patterns to my site by end of this year. I had to leave OOPSLA Tuesday morning to catch an early flight to Denver. The Colorado Software Summit (CSS) is held every Fall in the Keystone Resort, near Breckenridge. Apparently, it snowed heavily on the weekend, making for beautiful vistas (and happy ski resorts). CSS started as a mailing list of OS/2 users, who helped each other out in face of poor documentation. It's now in its 11th year, and the first year I am attending as a speaker. I presented on Event-driven Architectures and gave a talk on mashups, featuring a live demo using Google Calendar, Yahoo! Pipes, and Google Mashup Editor. This talk was result of my observation / complaint after a Google developer that no presenter built a solution from scratch. So I put my money where my mouth is and prepared a talk that builds a mashup application from scratch. Luckily, the connectivity held up and the talk was a big success. The Colorado Software Summit has a peculiar format: every speaker gives each talk 3 times (meaning 6 sessions for me in total! ), giving attendees multiple options to see all their favorite talks without running into conflicts. It's a bit tiring for speakers, but a great idea. And, towards the end of the conference the talks tend to go very smoothly. The event was a little smaller than in past years, counting around 250-300 attendees. Being in a mountain resort gives the event a very cozy feel, with lots of interactions between speakers and attendees. I had the pleasure of meeting Dan, who is famous for being the chief implementation officer for the Dating Design Patterns book. He is married now, so the patterns seem to work. 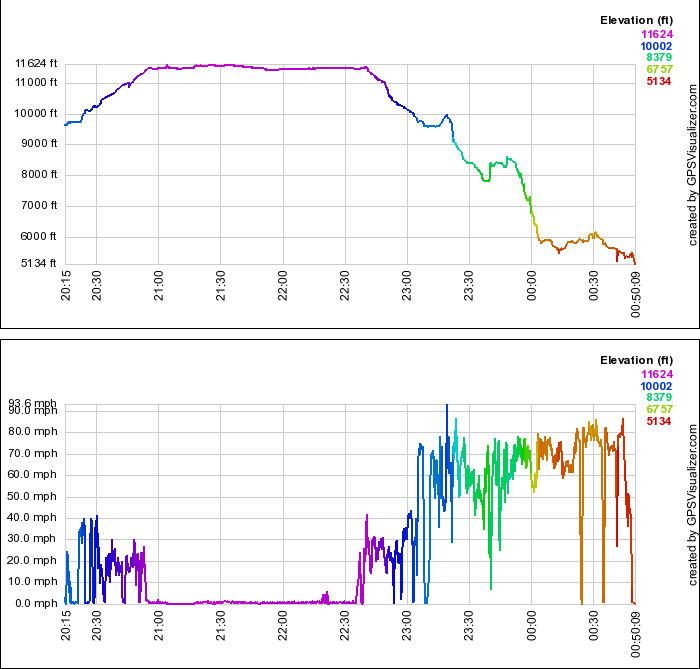 On the way back I collected some hard data towards the suitability of a Mustang for crossing an 11,500 ft mountain pass a few days after heavy snow fall (notice the 90 minutes of speed 0 at 11,00 feet). After a lot wheel spinning, digging, jacking, and towing, I ultimately managed to reach Highway 285, which is famous for leading through South Park.